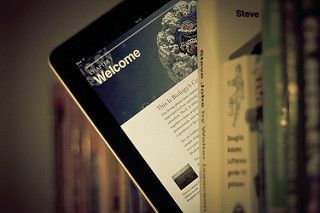 The future of books (Photo credit: Johan Larsson) On Monday, I posted some thoughts regarding an article from last week's Washington Post that was titled "Serious reading takes a hit from online scanning and skimming, researchers say." I was excited to see a rebuttal to Michael Rosenwald's perspective by his Washington Post colleague Valerie Strauss this week. "… teachers aver that students can no longer read long novels. Well, if we’re swapping stories, I — and most of my classmates — had a hard time with Faulkner and Joyce back in the early ‘80s, when I was an English major." "A more plausible possibility is that we’re not less capable of reading complex prose, but less willing to put in the work. Our criterion for concluding, “this is boring, this is not paying off,” has been lowered because the Web makes it so easy to find something else to read, watch, or listen to...If I’m right, there’s good news and bad news. The good news is that our brains are not being deep-fried by the Web; we can still read deeply and think carefully. The bad news is that we don’t want to."